This article is based on one that appeared in the Vauxhall Society Newsletter in January 1980. It is commonplace nowadays to hear people complaining about the decline of private enterprise. But what were conditions like in our area, say, 50 or 60 years ago, before large public companies and state corporations dominated the scene? We have some indication from the history of London’s taxicab and bus companies, many of which started as one- or two-man businesses and struggled to succeed in an atmosphere of fierce competition and economic depression. Several of these small firms had premises in our area. In the early 1920s, the operation of London’s buses was effectively monopolised by the London General Omnibus Company and its four associates. Then, in the summer of 1922, a single, independently owned bus, named the “Express” appeared on the No 11 route from Liverpool Street. It was run by Mr A. G. Partridge, a cabdriver who realised that the severe shortage of buses (after the requisitions of the First World War) and the absence of any licensing procedure as we now know it, left him a profitable opening. There was no limit on the number of routes which a firm, even with only one bus, could operate so long as the Metropolitan Police approved the vehicle type and the course of the routes. The possibilities of this situation were soon realised by dozens of other small firms. Many were started by ex-servicemen using their gratuity to invest in a bus, or by taxicab proprietors. They usually employed only a handful of staff each, the owner or driver doubling as mechanic, and perhaps putting in long hours at night to have the bus ready for the next day’s work. Buses switched between routes as often as they liked, to capture the best traffic. In January 1924, it was estimated that 200 independent buses, in 74 different ownerships, were competing with ‘the General’ on its services. The response of the big ‘combine’ was at first to try and bankrupt Partridge as fast as possible. He was harassed by LGOC buses which were specially instructed to precede and follow the “Express” everywhere it went. Plain-clothes observers reported on its movements and its passengers. And in 1923 the streets were flooded with over a thousand extra General buses to beat the independents out of business. They nearly succeeded. But a press campaign in the Daily Herald had championed Partridge against his bigger rivals; the nickname of ‘pirates’ for the independents became popular with the public; and the net effect was for a time to improve services across central London while also cutting fares. One of the more unusual independent operators, based at a railway arch in Hercules Road, was Mr Reginald Quickett. His only bus, bearing the name “Liberty” was originally purchased by F. A. Macquiston, the MP for Argyll. 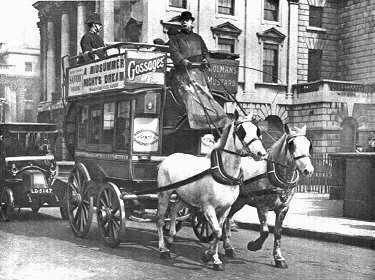 Macquiston believed that buses in London should operate just like taxis, plying for trade wherever sufficient people wanted to go. The severe traffic congestion of those days he attributed to the fact that buses always kept to recognised routes and could not take short cuts and diversions at the discretion of the driver. He also believed the LGOC was making excessive profits and wanted to test the market for himself. So Macquiston ordered a Leyland chassis in 1922 and an open-top bus body from Dodsons of Willesden. He offered Mr Quickett, a young ex-flying officer and first-class mechanic, to run the bus for him and pay for it, by instalments, from the profits. The Liberty bus, like its nearby neighbour the ‘Imperial’ bus (garaged at arch No 192 in Hercules Road), worked from March 1923 on many of the routes passing through Lambeth. Then competition forced Quickett to switch to other routes, and by the end of 1923 he moved his garage also, to Chalk Farm. In 1925 he sold out to another local operator, P.H.R. Harris, who worked from the taxicab garage at 1-3 Brixton Road. This location, owned by LGC Motor Co, is still used by cabs today. 1923 was also the first year of business for the Fleet bus company, based at 96 Hackford Road. The firm was founded by Mr Frederick Prowse, a vociferous entrepreneur, with three taxi-drivers as his co-directors. Between them they owned two dark green and white open-toppers which could be seen on most of the routes passing through the West End. After its first year, the business was still, like that of many other pirates, very shaky. Ten shillings per week was transferred by Mr Prowse from the wages of every employee into a suspense account, in order to strengthen the company’s finances. Wages were reduced twice in 1924. The Fleet crews, who received no bonuses, were thus some of the lowest paid busmen in London. In March 1926, Prowse was empowered to negotiate a takeover by the LGOC, which then provided substitute vehicles and spares for him until final absorption of Fleet in 1928. The buses then left Hackford Road for Nunhead garage; but the yard of No 96 is reminiscent still of pirate bus days – with its collection of old buildings, cobbled yard, fuel tank and pumps. Under the railway arches in Hercules Road, there were, apart from Mr Quickett, two other small bus companies. Arch No 192 was for a time in the 1920s the home of Mr Percy Frost-Smith’s remarkable petrol-electric buses. Arch No 194 was used by three engineers, Messrs Holliday, Bangs and Dengate, who decided to branch out into bus work under the name of ‘Imperial’. Nos 1 -5 Fitzalan Street, demolished in 1970 as part of the protracted redevelopment of Lambeth Walk, were the premises in 1925 of the Shamrock Traction Co. The running of Shamrock was largely in the hands of Miss Helen Kelly who, at 26, was an experienced driver and the youngest woman bus proprietor in London. Her co-directors were her mother and members of the family, together with a retired Indian Army captain. Salamanca Place and the Stockwell Service Station at 189 Clapham Road were also garages for independent buses for a time. All these premises, where they survive, are still connected with the motor trade. By the end of 1924, bus operations in London were chaotic. Racing between pirates and General buses frightened passengers, fines for speeding buses became commonplace, and there were incidents of sabotage. The London Traffic Act was passed, and restored a degree of order from 1925. It compelled bus firms to deposit schedules and routes with the police, who firmly enforced them. Restricted Streets Orders were made by the Government to keep down the numbers of buses crowding into central London and, later, to reduce competition with the trams. In the later 1920s, the economics of pirate operation drove many small firms to sell out. Seventy-seven of them were bought in 1927-28 by the Marquis of Winchester’s Public Bus Co, which promptly handed them over to the LGOC; other firms switched to long-distance coaching. Being taken over by ‘the General’ was a hazardous affair. It usually meant a drop in pay and instant dismissal for any former LGOC employee or person over fifty. Other ex-pirate staff were mysteriously declared unfit, e.g. for ‘flat feet’ – no joke in the days of the dole queues. But by the time the London Passenger Transport Board Was formed in 1932 (the present London Transport, in effect) only 64 independents remained. There had been 180 in the heyday of the pirates in late 1924. Within little more than a year after its formation, the LPTB had acquired them all: a colourful and at times dramatic episode in London’s life was over.